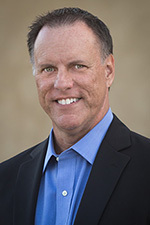 DirectAccess DNS Records Explained | Richard M. Hicks Consulting, Inc.
As far as I know, the requirement that the directaccess-corpConnectivityHost should resolve to the NAT64 prefix + 7F00:1 is only valid in an IPv4-only Intranet environment. In an IPv4+IPv6, or IPv6-only Intranet environment, I think that only a AAAA record should be created with the loopback IP address ::1. How to repair missing DNS entries? I checked our DirectAccess environment and there is only one directaccess-corpConnectivityHost in DNS. Is it possible to repair the missing entries and set them static? Yes, you can manually recreate the entries statically to prevent them from being scavenged, if necessary. I think that IPSEC tunnels must work also to success this DNS check. We’ve configured several independent DirectAccess deployments within a single domain. Currently 6 DA servers, each with its own configuration, policies, etc. I’ve managed to share NLS, and directAccess-WebProbeHost with no difficulty as you mentioned previously. However I’ve noticed the only DNS record for directaccess-CorpConnectivityHost is 127.0.0.1. Since we have multiple deployments with varying IPv6 prefixes how do we create the AAAA records so the DA clients/Servers don’t get confused if they resolve the wrong name for their IPv6 prefix? Forgot to mention, all these deployments are IPv4 IP-HTTPs configurations. I think you should be fine with a single directaccess-CorpConnectivityHost DNS record. The DNS64 service will return a AAAA record with the correct prefix for each deployment, so clients should not be confused. Currently I only have the 127.0.0.1 A record for directaccess-CorpConnectivityHost, how will it return a AAAA record when there isn’t one? Hi! Can you please explain how to get the NAT64 IPv6 prefix? Thanks! You can find the NAT64 prefix in the registry on the DirectAccess server at HKLM:\SYSTEM\CurrentControlSet\Services\RaMgmtSvc\Config\Parameters\Nat64Prefix. If you’ve configured DirectAccess for multisite you can also find it in the Remote Access management console when you select Configuration/DirectAccess and VPN and highlight the individual entry point. I’ve currently got a 2012 R2 single site IPv4 setup going with only Win 7 clients. It is configured for 6to4, Teredo and IPHTTPS. 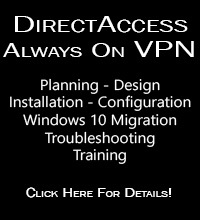 I have FOUR AAA directaccess-corpConnectivityHost records. That doesn’t seem correct? That’s unusual. The only thing I can think of is that you have installed and then uninstalled DirectAccess a few times and that these are stale records. Each time you install DirectAccess a new ULA IPv6 prefix is created which would explain the multiple records. I’ve only installed DA once. If there are 4 records that’s going to be an issue for any Win8+ clients I assume? I’ve checked the registry and the NAT64Prefix is fde8:8a2a:5a43:7777::/96 so should I just delete the others? You have some wonderful guides. Thank you for your help thus far. I’d like to know if you have any thoughts on how to get DA clients or VPN clients to register their IP addresses in AD. I’ve followed your guides, and have my DA and VPN on the same host (this is a POC). They are configured behind a NAT device with 2 network adapters. Everything seems to work fine with the exception of DNS registration. I’ve never run in to this issue, but fundamentally it works the same via DirectAccess as it does on the LAN. If you use the same problem resolution techniques as you would with a LAN client it should resolve the issue for DirectAccess clients. If we’re hosting a website for NLS & NCA on external HA servers; would DirectAccess still be using these WebProbeHost DNS records? Or would they be using the records configured for our NCA & NLS (DirectAccess-NCA.blah & DirectAccess-NLS.blah)? The WebProbeHost is created and used by default by DirectAccess. If you’ve changed it to something else using the Remote Access Management console, then there would be no need for those DNS records to exist. The address specified is the IPv6 address on the internal NIC (same IPv6 address on both servers); although when you edit the suffix entry it shows as the IPv4 address instead (different depending on which server you run the console on). we have 3 different and singe DA Server in one Environment. Can i share the first created directAccess-webprobehost with the other DA servers ? Or how i can use one directAccess-webprobehost with more as one DA Server ? In DNS i can only create one directAccess-webprobehost Host Entry. You can share the single URL, but if that server is offline, Windows 8.x/10 clients connected to the other DirectAccess servers will show “connecting” for their connection status. Here, a better alternative is to use another internal web server for the web probe host. It can be any internal web server that uses HTTP (not HTTPS) and it can’t be the NLS. Setting up dual multi-site with two entry points in the same physical location. The multi-site wizard assigned the same IPv6 address to both of the servers, is this expected behavior? IPv4 IP-HTTPS setup. The first DA server seems to work fine, but on the second one clients don’t seem to find a DC after connecting through the tunnel. Depending on your network configuration and chosen topology, yes, this can happen. Are your DirectAccess server’s edge facing with public IPv4 addresses? Thanks for the reply! Yes, they are. I had noticed IP conflict errors while the second DA entry point would not work, but I found this on a TechNet and it seemed to resolve the problem: “Set-NetIPInterface –InterfaceAlias –AddressFamily IPv6 –DadTransmits 0”. They both seem to be working now using the same ipv6 address. Thanks for this post. One thing I am trouble finding the answer on is if multiple web-probe hosts are configured in “step 1” of the DA wizard…. are those hosts treated as an “and” or an “or” ? I.e. if I leave the default web-probehost configured and add another one, do both need to be available? or only one or the other ? if this is in the doco and I have missed it, my apologies, but I couldn’t find it. Just going to throw this out there. There is a powershell cmdlet to help get the IPv6 prefix mapping, “get-netnattransitionconfiguration” when run from the DA server. Warning: One or more IP addresses of management server dc1.example.com cannot be added because they are associated with the web probe URL used to verify DirectAccess client connectivity. The server will be added without the conflicting IP addresses. Ensure that IP addresses associated with the probe URL are not configured on any management servers. Obviously the IP (internal interface of the DA machine) that the web probe URL points to is different then the IP addresses of any of the 3 dc’s. They are, however, on the subnet. Is this warning benign? That’s certainly a strange one. I’ve never seen this message before so I can’t really say it is benign. However, if everything is working ok and you have no other warning or error messages otherwise, perhaps it can be ignored. Keep me posted though! Thanks for the speedy reply Richard. I trouble-shooted the NLS inc cert, and hostnames (using split DNS & 3rd party Wildcard cert) for the website that was also living on the DA Server that the wizard created but still no luck. Yes the non configured DA clients were able to connect to the DA Server with no problem and didn’t give me any reason for why the DA Clients couldn’t see the website. I then built a new Web Server to use as the NLS, pointed DA Server to use it and now this has resolved in the console and DA Clients are working perfectly – Thanks again for your advice. We have a multi-site configuration in our environment(2 sites)and had this client saying “connecting” issues and client had issues connecting to the DA server on both the site.So we created “directaccess-corpConnectivityHost” record and issue got resolved.But again after 2 months we are getting the same issue in only one site.Users are getting issue connecting to one site and getting redirected and connect to the other site.Can you assist me with where the problem would be? There could be any number of reasons why this is happening, but understand that being connected via DirectAccess and the client showing “connected” are two different things. It is possible that the client is indeed connected, but if it can’t resolve and connect to the corp connectivity host URL (directaccess-WebProbeHost by default) it will show “connecting”. If clients aren’t being moved to another entry point, then I would have to suspect a connectivity issue that resulted in the client believing its entry point was unavailable. No matter how much I’ve re-read all this string and other comments. Just to be sure that I understood what you wrote as well as everyone else regarding the A address that are in the DNS server entry. Is the webprobehost address is supposed to be the same as the Direct Access server since in my case, after doing a lot of investigating I noticed that the server address is different from the webprobehost address? Having an issue with clients registering their IPv6 to the AD DNS. They keep getting 8018 error events saying the DNS server rejected their request. I can’t seem to narrow down the issue. All works fine internally and if I change the DNS server over to unsecured updates then it works fine. If the clients can access the domain from the outside, browse network, run login scripts, get GP…why would the DNS server deny them as unsecured? Any ideas on how to trouble shoot this? Thanks! Not sure what’s up there. Can’t imagine why it would work internally and not over the VPN connection. You might need to get Microsoft involved to assist in troubleshooting. Have to believe something is going on with authentication for remote clients though. 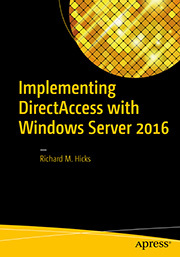 Richard, picked up your 2016 book because I’m having problems with Server 2016 and the DA setup. We were running on Server 2012R2 for many years and it had mostly worked fine, but when I switched to the new cluster with S2D on 2016, my old 2012R2 server would not migrate. Fine, I’ll just build a new one with 2016! I had it up and running but still have a couple issues that I can’t find reference to in the book, but your blog is helping. 1. Our internal network is both IPv4 and IPv6 with our internal being fd18:b44f:9055:7200:: and our DHCP hands out both v4 and v6. Our internal domain is corp.companyname.com and external just companyname.com. The server is a VM with two external IPs and one internal. It correctly picked up the external first IP and the internal IPv6 for the adapters. When everything is said and done, it comes up and I get the warning on the corporate network route publish. Not sure what else I need. 2. The directaccess-WebProbeHost does create the A record for the internal v4 address, but the clients always stick in a “connecting” state, but I think that is because DA is running strictly v6 and this DNS entry doesn’t has an AAAA record? Is this possible? Update, I ran the DA Client Troubleshooter and the client says it successfully reached the HTTP probe at http://directaccess-WebProbeHost.corp.companyname.com yet DA is still stuck “Connecting”. The only caution I received was for the the certificate does not contain the EKU Client Authentication, but DA is up and running. Still have the caution on the server for the Corporate network route publish. You won’t be able to establish a DirectAccess connection without a certificate that has the client authentication EKU. The tool could be reporting erroneously (it often does!) but I’d look at that closely. You can verify the establishment of DirectAccess IPsec tunnels using the Get-NetIPsecMainModeSA PowerShell command. If you have a certificate and network connectivity internally (see my previous reply) then you should have security associations (SAs) established. Although DirectAccess uses IPv6 for remote client to gateway communication exclusively, deploying DirectAccess with native IPv6 presents some unique challenges (as you have already found out!). First, you’ll need to ensure that you publish the DirectAccess client IPv6 prefix to the internal network so that DirectAccess client traffic is routed by to the DirectAccess server, not your network’s default gateway. The route publishing error is common when deploying DirectAccess with IPv6 on the internal network. You’ll need to run the following PowerShell commands on your DirectAccess server to resolve that issue. As for the webprobehost issue, I’m guessing that’s not working because you don’t actually have an end-to-end connection established yet. Once you’ve verified connectivity to internal resources, then you can come back to troubleshooting webprobehost failures. Hello Richard. I hope you still review this web page and i also hope you have an answer to my question. At my organization, we have enabled HSTS on our Direct Access Servers for the default site. Now the thing is, after enabling HSTS, we are still able to get to the default site over HTTP. The reason for this big push is that we want all of our public facing servers to use HTTPS and nothing else. So after the failed attempt to enable HSTS, i implanted a firewall rule to block all incoming and outgoing traffic on port 80. Now direct access still works, but on the client machines it says that it is always “connecting”. My question is, how does Direct Access exactly determine it need to use the connection settings and does it use port 80 for any of this? Can i change that so it uses only HTTPS?